The Laura Plantation is a historic Creole sugar cane plantation from 1805 in Vacherie, Louisiana. Laura Locoul Gore, for whom the plantation is named, was among the fourth generation of her family to run the sugarcane plantation. Every day, the plantation recounts the Creole slave experience and strives to provide an honest accounting of what slave life was like on the plantation and in Louisiana, the last state to abolish slavery. Much of the interpretation of the site’s history comes from Laura’s writing, published in her memoir, Memories of the Old Plantation Home. Admission to the site includes a guided tour of the Big House, its aboveground “basement,” separate men’s and women’s parlors, common rooms, and service rooms. 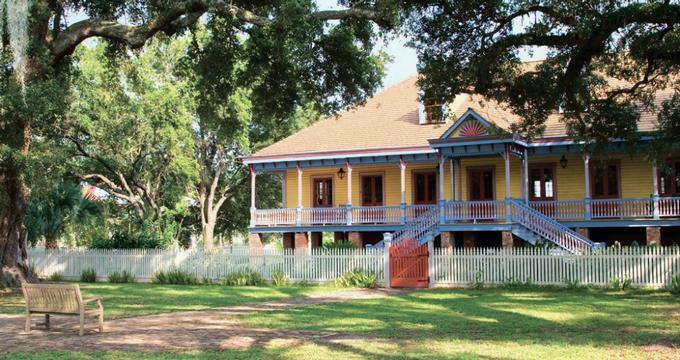 The Big House is notable as one of just a handful of substantial Creole homes in existence today, its Federal-style interior woodwork and Norman-style roof make it unique among examples of late Creole architecture. The home is furnished with original period furnishings, many of which were donated by descendants of the Duparc family, who originally owned the plantation. Tours continue through the home’s three gardens, the French garden, kitchen garden, and banana grove. Four of the original 65 slave cabins are still on the property today. The tour concludes with a visit to one of these 1840 cabins, where the West African tales of Compair Lapin, or Br’er Rabbit, were recorded by Alcée Fortier in the 1870s. Twelve of the buildings on the plantation’s grounds are listed on the National Register of Historic Places, including the slave cabins, animal barns, overseers’ cottages, and the Maison de Reprise, or mother-in-law’s home, built in 1829 for Laura’s great-grandmother Nannette Prud'homme Duparc, the first woman to lead the Duparc Plantation as president. Guillaume Duparc, a French veteran of the American Revolution, acquired the 12,000-acre plantation in 1804. The cleared, elevated plot of land was unusual and very valuable. Duparc immediately began construction of his home at the center of the property, on a parcel of land that had been occupied by a Colapissa Native American village for centuries prior. The home and subsequent slave quarters and outbuildings were built by Senegalese slaves. By 1805, the sugarcane plantation was in operation with 7 slaves, 6 Senegambian and 1 Native American. By the start of the Civil War, close to 200 slaves lived in 65 cabins on the plantation. Upon Louisiana’s 1866 emancipation of slaves, the majority of the slaves remained on the property until they were displaced in 1895 when a local lumber company made use of the cabins for their own employees. It wasn’t until 1977 that the last residents of the cabins moved out, and four cabins remain on the property today, while many of the descendants of the Laura Plantation’s slaves live nearby. Laura Locoul, Duparc’s great-granddaughter and matriarch of the fourth generation to head the sugarcane plantation, sold the plantation in 1891. It continued to operate as a sugar plantation for almost another 100 years. In 1936, Laura compiled all her memories of life on the plantation, as well as oral histories of the past 100 years, into a memoir, which was later discovered and published in the year 2000, and serves as a guideline for interpretation of much of the site’s history. Included in the memoir is the story of Alcée Fortier’s recording of the Br’er Rabbit and Br’er Fox stories. Fortier, who would later become a professor at Tulane University, visited the slave cabins to record the traditional Senegalese folk stories. In 1993, the Laura Plantation Company, a private enterprise, purchased the old homestead with the purpose of refurbishing it and opening it as a Creole attraction. Some of the investors are descendants of the plantation’s former owners. The Big House was rebuilt after it was destroyed by an electrical fire in 2004, and reopened in 2006, despite the interruption of Hurricane Katrina. The museum is funded today through admissions fees and gift shop purchases. The Laura Plantation can only be explored on a tour. Guests arriving in groups of 20 or more must make reservations in advance. Discounted group tours are available for school groups and are customized to meet General Learning Education benchmarks for students in grades three through twelve. Visitors to the Laura Plantation are encouraged to stay at a nearby Bed and Breakfast and to enjoy one of the many Creole restaurants on the Great River Road leading to the plantation, as there are no lodging or dining options on site.